Smuggled goods in China are a major sub-industry in the burgeoning country. Among the usual black market goods like electronics and Louis Vuitton bags, a new product has emerged as a hot commodity: baby formula. 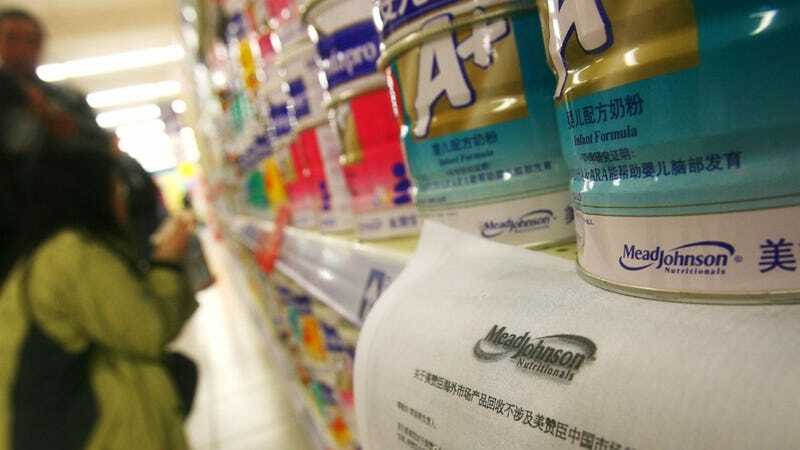 After the death of six babies from a melamine contamination in 2008, with over 300,000 children reported ill from ingesting the bad baby formula, Chinese parents are right to be wary of Chinese-made formula. The demand for foreign baby formula has sparked an entire industry of smuggling, with a smuggling-ring bust in April that seized 220 pounds of formula. Outside of the black market, Chinese parents are turning to relatives living abroad to mail them packages of baby formula. Chinese tourists have been buying formula in such quantities that it's been causing shortages in foreign markets, like New Zealand and in the UK. Retail chains like Boots have been enforcing a two-can limit of baby formula per purchase, while custom officials in Hong Kong only allow two cans out of the territory into the mainland. But with a strict one-child policy and reportedly 41 percent of Chinese stating food safety as a concern, the desire for foreign, and safer, baby formula at all costs seems entirely reasonable.